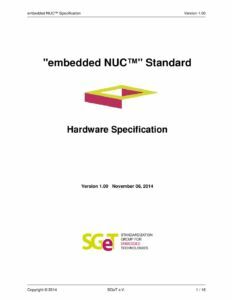 Embedded NUC™ specifies a new industrial standard for small form-factor PCs inspired by the Intel® NUC systems (NUC: Next Unitof Computing) used in consumer products. By adapting the Intel® NUC for industrial applications, a wide range of PC functions in an extremely slim format (ca. 10cm x 10cm) can be realized. With its PC power the embedded NUC™ presents a highly attractive solution for industrial applications targeting a wide range of appliances while providing numerous interfaces in a compact format.